Find and Replace in Excel allows you to quickly search all cells and formulas in a spreadsheet for all instances that match your search criteria. 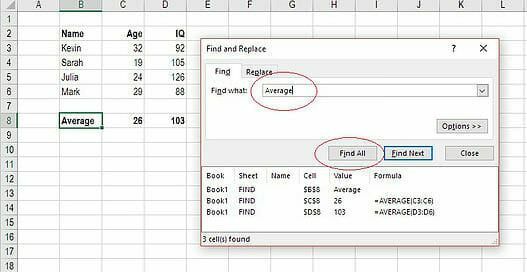 This guide will cover how to search in Excel and use find and replace in Excel. To see a video tutorial of Go To Special check out our free Excel Crash Course. Why use the Excel Find function? There are many good reasons to use the Find function when performing financial modelingWhat is Financial ModelingFinancial modeling is performed in Excel to forecast a company's financial performance. Overview of what is financial modeling, how & why to build a model. A 3 statement model links income statement, balance sheet, and cash flow statement. More advanced types of financial models are built for valuation, plannnig, and in Excel. The main reason is to use it in conjunction with the Replace function, to quickly edit many cells and/or formulas at once. For example, if you have hundreds of cells with formulas that link to a specific cell, you may want to use find and replace to change that one cell that all of the formulas link to. This will save you the pain of individually editing each cell with that formula, and guarantee that you don’t miss any. For more time-saving tips, here is a list of all Excel shortcutsExcel Shortcuts PC MacExcel Shortcuts - List of the most important & common MS Excel shortcuts for PC & Mac users, finance, accounting professions. Keyboard shortcuts speed up your modeling skills and save time. Learn editing, formatting, navigation, ribbon, paste special, data manipulation, formula and cell editing, and other shortucts to speed up your modeling. Below is an example of how to use Find and Replace to change the SUM formulas in the below table to all become MEDIAN formulas. Congratulations, all your SUM formulas are now MEDIAN formulas! 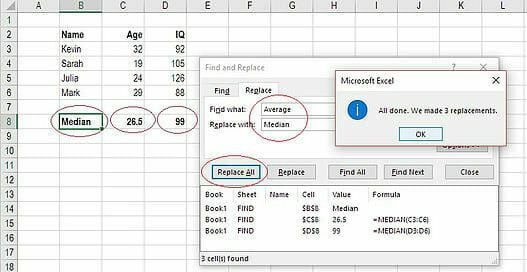 Thank you for reading CFI’s guide on how to search in Excel and how to find and replace in Excel. If you want to master Excel please check out all CFI’s Excel Resources to learn all the most important formulas, functions, and shortcuts.